The Nokia N95 Classic – Black! 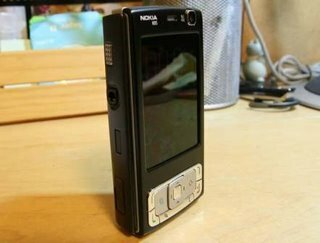 I have always thought that a black N95 would be awesome, however the styling on the Nokia N95 8GB has disappointed me a little. I don’t really like the smaller Menu & Multimedia keys and the lack of cover for the camera. For those (including me) who only want it to be black yet with the same shape here is a solution. The phone looks great, but protruding silver at places completely mars it at times. I’m hoping for an all black housing soon, specially the keypad! Jump over here to have a look. Previous PostTagged! Five Blogs I Read!Next PostShould You Get The N95? This blog is simply smashing. In my humble opinion of course. As this post is rather debatable I don’t think all your blog visitors are going to agree with it. cn any1 do it by himself?